Debbie’s paternal grandparents had both a housekeeper and groundskeeper who lived in their basement apartment. Nina and Silas were like part of the family and had lived with the grandparents for as long as Debbie could remember. On many occasions, when Debbie’s parents and grandparents went out to dinner, she and her older sister were left in the care of Silas and Nina. The girls’ parents had no idea that Silas was molesting their precious children time and time again. From the time Debbie and Beth were three and six years old, until they were ten and thirteen, Silas fondled and sexually molested the girls in the basement apartment lit only by the black-and-white television blinking in the background. While Silas ravaged Debbie’s body, her sister held her face in her hands and told her stories. Together, the girls escaped to a land faraway while the worse nightmare imaginable was played out before them. Silas warned them, “If you tell anybody, I’ll hurt your brother.” So the girls suffered in silence. When Debbie was ten years old, she and her sister spent the night with her maternal grandmother while her parents were away on a business trip. The elderly grandmother paused at the opened door to watch her precious granddaughters kneeling beside their bed. With arms wrapped around each other they began to say their prayers. The stunned grandmother clutched her heart, rushed to embrace the girls, and sobbed uncontrollably. The rest was a blur. A few hours later, in the wee hours of the morning, their parents came back from their business trip…two days early. The girls could hear their parents crying in the next room, but nothing was ever mentioned about Silas. All they knew was that the next time they went to Grandma and Grandpa Wilson’s house, Silas and Nina were gone. Years passed with little mention of the years of abuse by Silas. Like old war veterans who never mention the horrors of battle, the girls never mentioned the molestation again. However, the chronic pain of the past was an undercurrent to their total existence. Debbie felt dirty, used, and cheap. She felt like damaged goods. Debbie accepted Jesus Christ as her Savior when she was a small child, but she had a difficult time believing Jesus could accept her. She didn’t see herself as a precious holy child of God dressed in robes of righteousness. She saw herself as a dirty orphan dressed in tattered rags. Then one day, she went to a Bible study and heard for the first time about her identity as a child of God. “I didn’t feel like a holy child of God, but that’s who the Bible said I was,” she explained. “I read and reread that list of who I am in Christ. The more I studied about my new identity and the truth that sets us free, the more I began to accept it as true. I began to realize it was Satan who held up the picture of Silas and what he had done to me to remind me of who he wanted me to believe I was. Debbie accepted her new identity. It was there all along, like a cloak waiting to be placed on the princess’ regal shoulders. She received the robe of righteousness and now walks with the confidence of a dearly loved child of the King. This devotion may have been difficult for you to read, but it is very important. No matter what you have been through, if you know Jesus as Savior and Lord, you are a pure and holy child of the King. Have you accepted your new identity? Are you ready to start believing the truth? Are you ready to put off the ragged robes of shame and put on the robe of righteousness that Jesus purchased just for you with His own life? He’s holding it open for you right now. Slip it on. It’s just your size. Dear Heavenly Father who loves me, I come to You with a heart humbled by Your tender love for me. I thank You that You have removed the filthy rags of this world from my life and clothed me with the righteousness of Christ. Help me to hold my head high as a child of the King. Are there any rags of shame that you’ve been wearing? Anything from the past that you need to take off and throw away? If so, let’s do it! It doesn’t fit you anymore. Put it in the trash and get rid of it. Read Colossians 3:10 “...and have put on the new self, which is being renewed in knowledge in the image of its Creator. Now, that looks good on you! 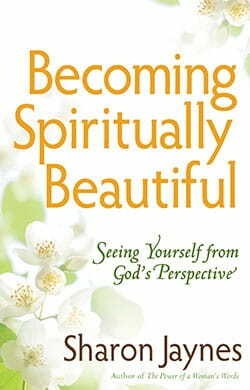 Today’s devotion originally appeared in Becoming Spiritually Beautiful: Seeing Yourself from God’s Perspective– one of my favorite books! Learn how to see yourself as God sees you. Let Him hold up the mirror of His Word to show you what you really look like in His eyes! This is a perfect book for a group Bible study or individual study. The study guide is included in the back of the book. And wives, check out my app, Praying Wives.